A round-up of all improvements and changes to the Buzz platform in version 2.0.79, available on December 1, 2016. Changed the name of Homework activities to Practice Questions activities to better reflect how they work. Essay questions and workspaces are not supported in this activity type. Added help text to the Add activity template window. Improved the security of subscriptions to verify that the user attempting to discover and utilize the resource has either a teacher enrollment or admin permissions in the domain that is subscribed to the resource. Improved tab behavior in the Activity Grader/Grade Editor. Fixed an issue that caused the prohibited file extension list to merge incorrectly. [IE 11 and Edge] Fixed pagination display issues that occured on Admin grid pages. Added a warning message letting authors know when they're partial scores don't equal the total score for a question. Fixed an issue that caused an error when a teacher would change a question type to Matching, Passage, or Custom, and then try to save. Fixed an issue that caused the Syllabus tab and Projects tab to display contradictory project End Dates at times. Fixed an issue that would show only one blank when an author would preview a Fill in the blank question that had more than one blank. Fixed an issue that allowed the date picker popup to remain on the screen after navigating away from it. Fixed an issue that would swap the Name and Group values when initially creating and saving a Variable List. Updated code to better recognize and format questions created using HTML. When using the Text editor for a question, if you want to create a new line in a question or answer body, you can place the content on a new line but prefixed with three spaces. Alternatively, you can use the [HTML] syntax and place a line break with the HTML <br> tag. Fixed an issue where the question previewer wouldn't correctly display linked question types. Corrected the way inline matching questions are displayed in author preview. Removed date-controlled setting options from Activity Editors in continuous courses. [Firefox] Fixed an issue that caused Buzz's About link to display the wrong browser. Fixed an issue that allowed unsupported styles to be pasted into the rich text editor. Eliminated some erroneous scrolling behavior. [IE 11] Fixed an issue in which scrollbars would not work in read-only editors. Added error message that appears when a user enters the wrong password when trying to print a password-protected assessment. Fixed an issue where a SCO could not set a status of incomplete for a non-gradable activity. Fixed an issue where activities that were flunked for being past due would not reflect as a completed activity in the course completion percentage. 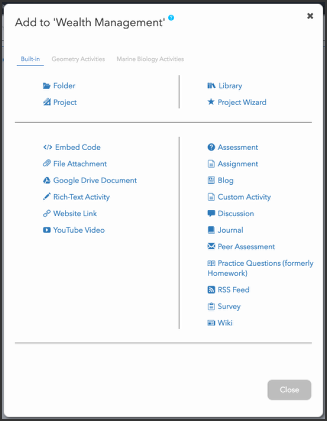 Added the ability to select folders as Course Links. Updated Multi-Outcome Scoring Gradebook settings to honor display settings and hide minutes. Fixed the Remove Question button in the assessment Analytics page. Updated resource filename rules to accept hashtags and percentage signs. Fixed an issue that allowed equations to overflow the field they were entered into. Fixed an issue that kept the submitted icon from appearing in the Activities toolbar after a student submitted a Discussion, Blog, Journal, or Wiki submission. Fixed an issue that would erroneously display a grade weight for activities that had been excluded from the final score. Also added an indicator to activities that have been so excluded. Removed scrollbars from essay question responses. Removed Print button from the preview exam window. Fixed an issue where a teacher would excuse a student's activity that some scored data ('scoredate') was not recorded on the teacher's response. It appears that something in this last update did something similar to what update (2016-10-03) did. On 12/2 all teachers noticed that past due assignments were no longer available for students to complete.